What is the Test Designer? 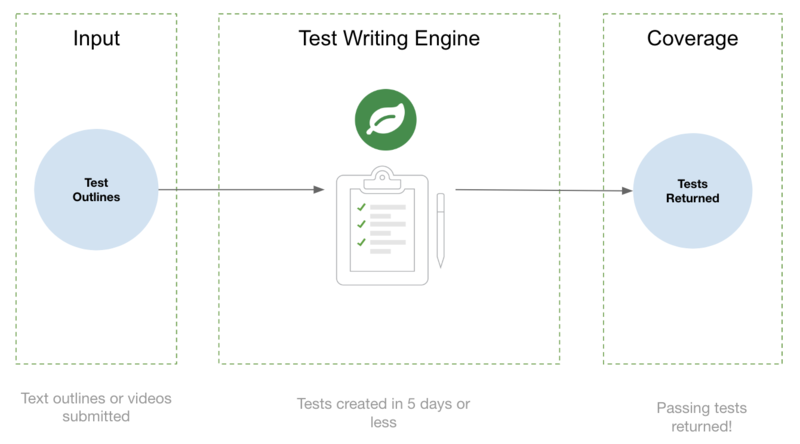 Now you can initiate a Test Designer run from a dedicated page by outlining high level information about the desired tests and receive green tests within 3-4 days. The Test Designer (TD) lets users get ramped up quickly with Rainforest with a fraction of the effort currently needed for test writing. Through this, users can request 10-20 tests and get these tests back in a passing state. This means that the Test Designer gives users tests that can be added to their test suite for execution without an immediate need for refactoring. How to use the Test Designer? Navigate to the Test Builder page from the left nav bar – this is where the Test Designer lives. Click on the “New Test Suite Request” button. This will take you to a kickoff page where you first give your run a name, provide a high level description and share credentials with testers, if necessary. Fill out the test outline form. This should include a descriptive title – something that can identify the test in one sentence – the URL to the testing environment, and a brief but descriptive test outline for each test. The outline can be as simple as a step-by-step instruction for the functionality, or it can be very descriptive. We’ve included several examples below. Add new tests to this suite and fill out the above details for each of them. Submit the run by hitting “Request Tests”. Rainforest will assign test authors and reviewers to create the requested suite, delivering back passing tests in 3-4 working days. Each of the tests generated by the TWE are written and reviewed by a team of trained test writers that get to know the client’s application over time. How does the Test Designer work today? Submission. Users fill out the form provided in the UI and submit the test writing engine run. We recommend submitting 10-20 tests. Receive tests. Once the reviewer is done, the tests are received by the client in their RF account. What kind of information do users need to provide for a successful run? Check that the environment you’re using works. This is a very common source of issues preventing successful test delivery. This could mean anything from allowing testers to log in, all the way to the environment not throwing up serious issues while testers are using related features or functionalities. Provide credentials if they’re needed. Provide enough detail for testers to follow instructions. There should be detailed instructions on what the tester should do. If testers do not have enough information, they will make assumptions to move forward and this may not align with the desired outcome. Avoid business and sector-specific jargon. “Ensure that when the user is in the My Pay section, that clicking on the dependent will expand to reveal more information. Also make sure that the eye icon will show/hide the SSN of the dependent as well as the SSN of the employee in the upper right corner of the my profile page. "Click on "my pay" from the dashboard. Click on all of the links under Financial tools and verify that each page takes you to the correct calculator. Ensure that each page loads properly."